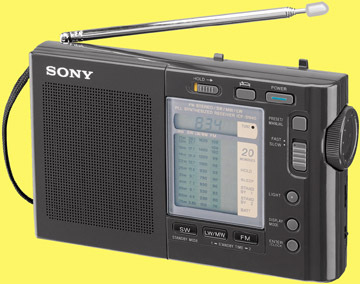 The Sony® ICF-SW40 is both an analog and digital portable! This large LCD display combines the accuracy of digital readout with the intuitive operation of analog. It covers long wave, medium wave (AM), FM, FM Stereo and shortwave from 3850 to 26100 kHz. This model features: 20 memory presets to store your favorite stations, two-positon tone control, a DX/Local switch to adjust sensitivity and an LED tune indicator. It also has a clock with sleep function and will wake you to either radio or a buzzer. The LCD will temporarily back light with the touch of a button. Dual standby lets you set the built-in alarm to sound at two different times or wake you to two different radio stations. There is also a very handy button for Normal or Fine tuning. In the Normal mode is 10 kHz (or settable to 9 kHz) for AM band, 5 kHz for shortwave and 0.1 MHz for FM. 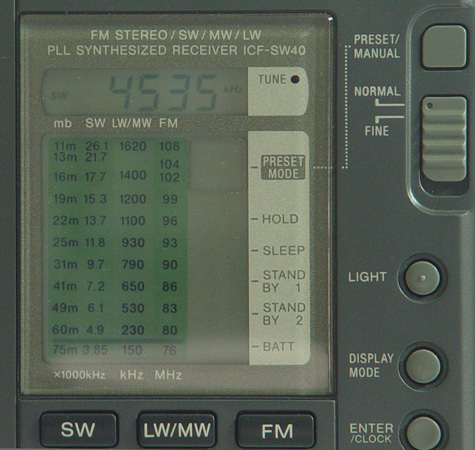 In Fine mode tuning steps drop to 1 kHz for AM and shortwave and 0.05 MHz FM. There is also a dial lock. The left side of the radio has jacks for: DC input and earphone. The right side has a two position tone switch and tuning knob. 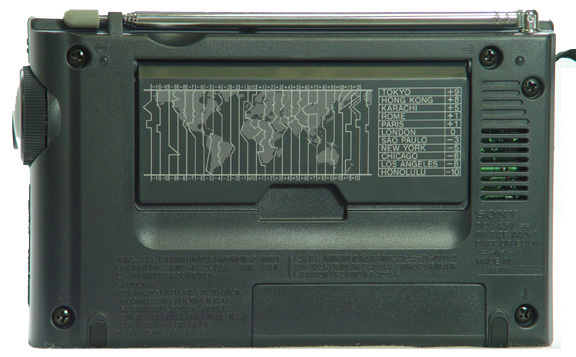 The rear panel has a flip-stand. Includes cloth case. Requires three AA cells (not supplied) or 4.5VDC. Only 6.75 x 4.25 x 1.62 inches 15 oz. (171x108x41mm 425g). There was an optional Sony AC E45A 4.5VDC AC adapter available. The input voltage was 100-240VAC. (The AC E45A employes a switching power supply, and thus may emit slight RFI on certain frequencies).